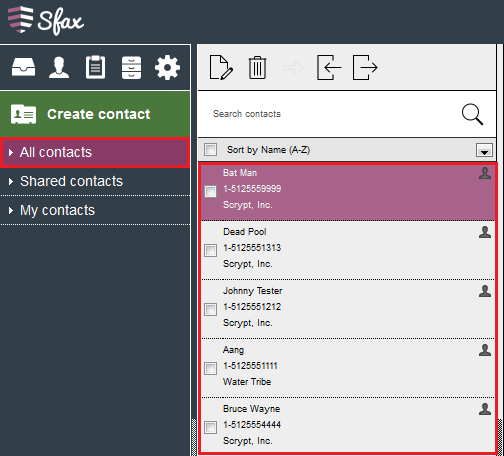 In Sfax you have multiple fields that can be populated when importing contacts. The first portion of this document explains the fields you can select from and how they will need to be configured on your CSV file. The second portion will demonstrate the steps in order to import your CSV file into Sfax. 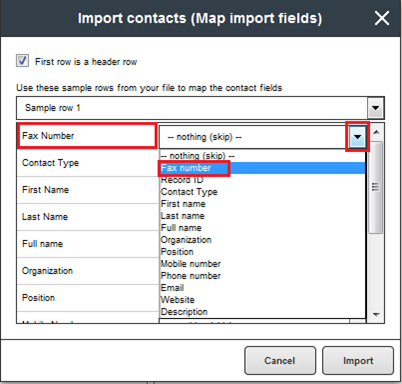 The contact fields that can be imported are: Fax number, Contact Type (My contacts or Shared contacts), First name, Last name, Full name, Organization, Position, Mobile number, Phone number, Email, Website, and Description. Attached to this guide are two sample CSV files that show the various fields that can be utilized and the how they name fields can be configured. The number fields must be in correct format or this may cause an error when attempting to import. The import tool will check the number fields to determine if the formatting meets the criteria when attempting to import. If the number does not meet the correct formatting the contact will not import. My contacts allows you to store contacts that are only seen by your user account and can only be edited by your user. Shared contacts will share the contacts with the users on your account. Shared contacts can be edited and deleted by all users on the account. 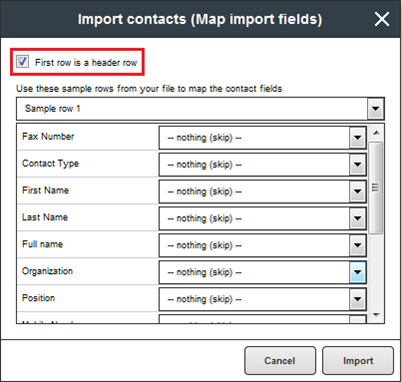 To designate if the contact is to be imported under My contacts or Shared contacts you will need to list the field for Contact Type as either My or Shared. 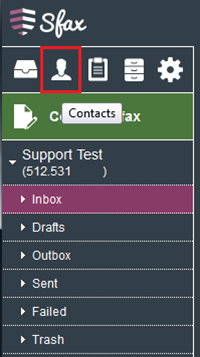 If you do not designate My or Shared in the Contact type field the contact will import under My contacts. If your CSV file lists your contacts as First name in one field and Last name in a separate field you are unable to select the field for Full Name as an option. If you have the Full Name of your contact in one field then you are unable to select the First name and Last name fields. 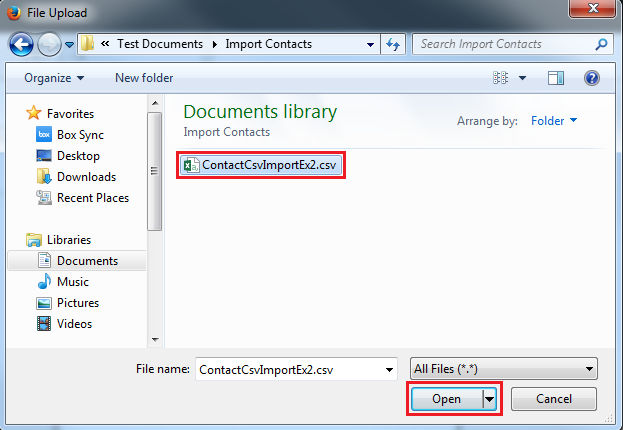 The CSV file will need to have all contact names configured the same way in order to import properly. Please see the two example CSV files attached to this guide that show how the name fields can be configured. After you have signed into Sfax you will need to navigate to the Contacts area. After navigating to the Contacts area you will need to select the Import option. After selecting the Import option you will be presented a box that allows you to search for the CSV file that you would like to import. Once you have navigated to the CSV file you would like to import highlight the file and select Open. After selecting the CSV file you will see the file name displayed and are ready to select Next to continue the process. At this point you are now able to map your fields for importing. If you have a header row on your CSV file place a check in the First row is a header row box to eliminate this line from being imported. The first four rows of the CSV file are able to be viewed as Sample rows to assist in mapping your fields. Select the drop down button to see the mapping options and select the corresponding field matching your sample row. You will need to map each field to the corresponding field. 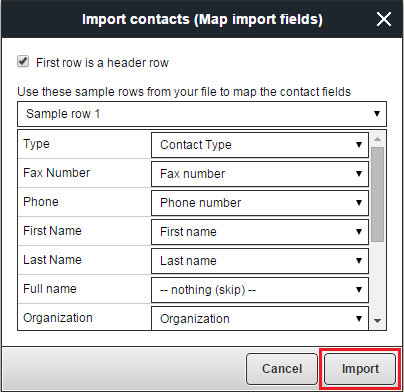 After you have mapped all of your available fields you are now ready to import your contacts. 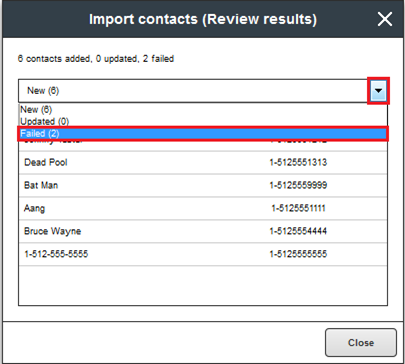 Select the Import option and this will begin the import of your contacts. Once the import process has completed you will see the results of your import. 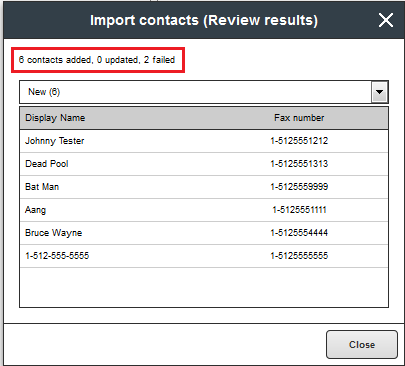 This will display the number of contacts added, updated, and failed. If your import results return failures you can see what has failed by selecting the drop down and selecting the Failed results. Once you have selected the Failed results you will be provided with the row number of your CSV file that caused the failure and why the failure occurred. 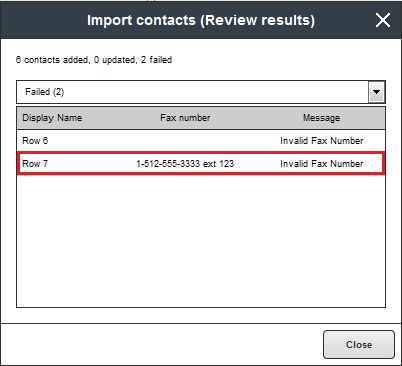 In the example below the fax number has an extension attached which indicates this as an Invalid Fax Number. After you have reviewed your results and notate any failures you can close the review results box. You will need to manually create any contacts that failed to import. After you closed the results box you will be taken to your All contacts area and will be able to see the contacts that you imported. You have now completed the process to import contacts into your Sfax account. If you have any questions or encounter problems when importing contacts please contact our support desk for assistance.